Venison, Venison Broth, Venison Liver, Ground Barley, Sweet Potatoes, Carrots, Ground Flaxseed, Canola Oil, Guar Gum, Salt, Tricalcium Phosphate, Potassium Chloride, Carrageenan, Iron Proteinate, Zinc Proteinate, Choline Chloride, Vitamin E Supplement, Cobalt Proteinate, Copper Proteinate, Manganese Proteinate, Riboflavin Supplement, Sodium Selenite, Thiamine Mononitrate, Vitamin A Supplement, Vitamin B12 Supplement, Potassium Iodide, Biotin, Vitamin D3 Supplement. Cover and refrigerate the unused portion. 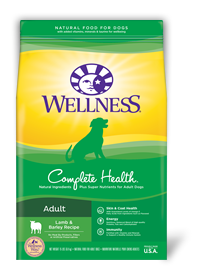 The amount of food your dog requires depends on age, activity level, breed and environment. Feed 170oz for every 3lbs of body weight per day. 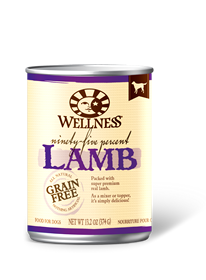 Feed one can 354oz for every 7lbs of body weight per day. 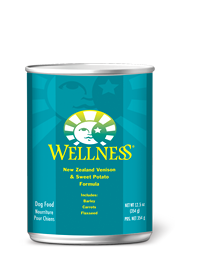 Wellness® Venison & Sweet Potato Recipe® Complete Health Dog Food is formulated to meet the nutritional levels established by the Association of American Feed Control Officials (AAFCO) Dog Food Nutrient Profiles for all life stages.